Hello there dear Couchers and welcome to the May 4th edition of Tuesday Couch Potatoes. Oh my, I can't believe it is already the month of May! First, just a quick note to let you all know that I am so happy that TCP is now on it's 37th theme... and YOU made it all possible! Thank you for coming back here every Tuesday to join us. This week's theme is From A Book (Novel-Based Movies). I know that there are lots of novel-based movies out there. Wikipedia lists 1,955 of them so if you think the movie you have in mind is already taken, why not take a look at the list? I am sure you will find the one movie that you like. It does not necessarily have to be the movie whose novel you have also read. Any novel-based movie will do. My pick will of course have to be my all-time favorite: The Lord of The Rings Trilogy - The Fellowship of The Ring, The Two Towers and The Return of The King. If there's a film out there that has turned a book's characters very effectively to life, that would have to be no doubt the LOTR trilogy. 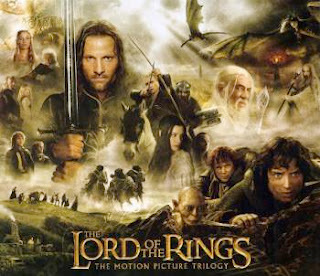 The Lord Of The Rings is a series of high fantasy books written by JRR Tolkien. I have read four of his works, The Hobbit and The LOTR and even practiced writing in the Dwarvish runes. And although there are some scenes from the book that were excluded in the film because they make the runtime longer, I'd have to say that the essentials were there. You can also always watch the extended edition. After watching the films, I decided to reread the books and the characters seem to come to life again, as if Frodo, Arwen, Legolas, Aragorn and Gandalf were just beside me, keeping me company. That's how effectively the films were to me. The sountracks and musical scores were great too that Enya has become one of my favorites. I do not need to write a synopsis right? Most of you must have already seen this trilogy. I've got good news to all fans of Middle Earth too! There is an upcoming two-part film entitled The Hobbit and will be released in December 2012 (part 1) and December 2013 (part 2). And the good news is that it will no longer bridge the gap between The Hobbit and The Lord of The Rings but will do the whole story of The Hobbit including the White Council and the comings and goings of Gandalf to Dol Guldur. Isn't this fantastic news? Joining us this week? Don't forget to add ur TCP link to the MckLinky below for some link love and so that others may visit you too. That's it for this week's edition of Tuesday Couch Potatoes. Next week, we will feature movies with Numbers in their titles. Thank you for joining! Take care everyone! Have a good week and a Happy TCP! Aga ng mga movie buff ahh. ako bukas na siguro tire ako ngayon. i loved LOTR! Michael Lewis is the author of The Blind Side..
Pareho kayo ng sister kong si Kim, mga fan ng LOTR, napanood ko lahat yan but not my favorites. Take care. Oh, LOTR! I fell hopelessly in love with Legolas when I saw this film. And.. yes, I kind of.. read the books (courtesy of Mommy Liz) as well, lol! I concentrated on classics when I was in college, and I enjoy something historical and cultural like AMISTAD. Great post! i missed TCP for the past few weeks..